Yes.... rain forest. The Sunart oak woods are officially and ecologically classed as "Temperate rain forest". These woods do have something in common with the seasonal tropical rain forest; "epiphytes"... orchids and ferns in the topics; liverworts and mosses here in the N.W.Highlands. Sunart also has some similarities with the coastal rain forest of the Pacific Northwest; epiphytes, high annual rainfall, sea mist and clean air. Constant rain enables trees to grow on the thinnest soils, you often see quite large trees, usually Rowan growing on the tops of boulders ,its the rain that enables this. Our clean Atlantic air means that the lichens and mosses flourish , their absence is a good indicator of pollution. Park at the RSPB car park just west of the entrance to Glenborrowdale Castle then follow the footpath from the road side up into the big old oaks. Yesterday the the sun shone, roe deer had been up the track before us, a pine marten left it's shiny black turds full of rowan skins on a rock. No eagles and no red deer on the surrounding hills but it's enough to know that they are there somewhere. You emerge on to the road east of the distillery with a short walk to the Nature Centre with it's excellent cafe and lunch. A couple of weeks ago I watched a huge John Deere tractor direct drilling winter wheat into the stubble of the previous bean crop. 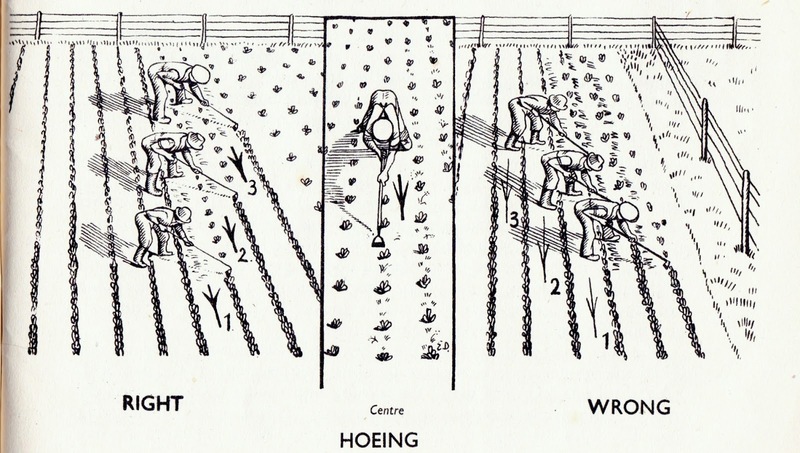 A process that used to involve at least ploughing, cultivating, drilling and rolling is now done in one pass by a tractor that is computer controlled and guided by a GPS system. The driver was there presumably to switch the machine on and off and to take it home on the road. I used to think that farm workers were some of the most skilled people who had a vast fund of knowledge gained largely informally by experience over lifetimes. Computers and robotics de-skill the workforce so that they become machine minders, there to deal with malfunctions and breakdowns. Not much better than working in a call centre. 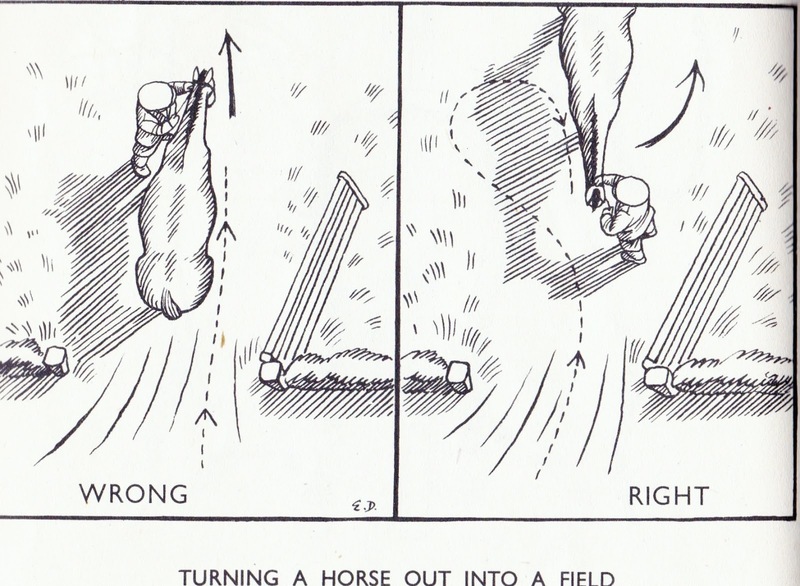 A horseman would have been the equivalent of that tractor minder a hundred years ago. 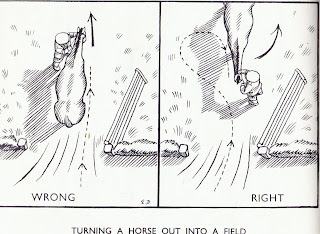 Now how many people could turn a horse and cart into a field without taking out the gate post; or put a horse between the shafts of a cart and then load the cart safely. 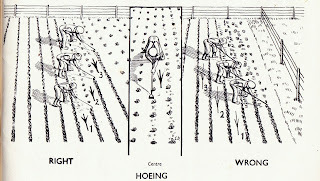 A gang of five or six of us used to "single" turnips by hand with hoes. What would happen if cyber warfare hackers destroyed the GPS or control software? Just in case, I thought I'd show you how some of these things are done. I found them in an old training manual for the," Women's Land Army" published in 1941. I'll hang on to it, you never know when it might be needed again. Until scientific quantitative genetics was applied to poultry breeding in the 1950s most table chickens were pure bred Light Sussex, Indian game, Dorking .... a whole range of traditional pure breeds that grew slowly to heavy weights. Then growth rate and feed conversion efficiency became the main selection criteria. This resulted in today's fast growing, industrially produced broilers in your supermarket. Supermarket chicken has the taste and texture of soggy cardboard ( except perhaps for free range organic brands). Traditional table breeds, raised on grass, fed on grain and finished at anything up to five months of age are completely different. The difference is like that between farmed salmon and wild caught salmon. Wild caught fish have better texture and flavour. This year I hatched some Cornish Game just to find out how fast they grew and what they tasted like when compared with my La Bresse poultry. In France La Bresse are a real luxury, people are prepared to spend up to fifty Euros for one. You can see them displayed in chill cabinets, still with the head on and their distinctive blue feet and legs to make sure that they are genuine. This morning when I weighed a carcass of each the Cornish Game weighed 3.6 kg at 20 weeks and the La Bresse 2.3 kg at the same age. The Cornish Game had grown fifty per cent faster under the same conditions. Of course this wasn't a properly replicated and controlled randomised trial. It also appeared that the CG had more breast meat than the LB. On Thursday they will be cooked by Mrs. Campbell and then tasted by a panel of five. Results on Friday. 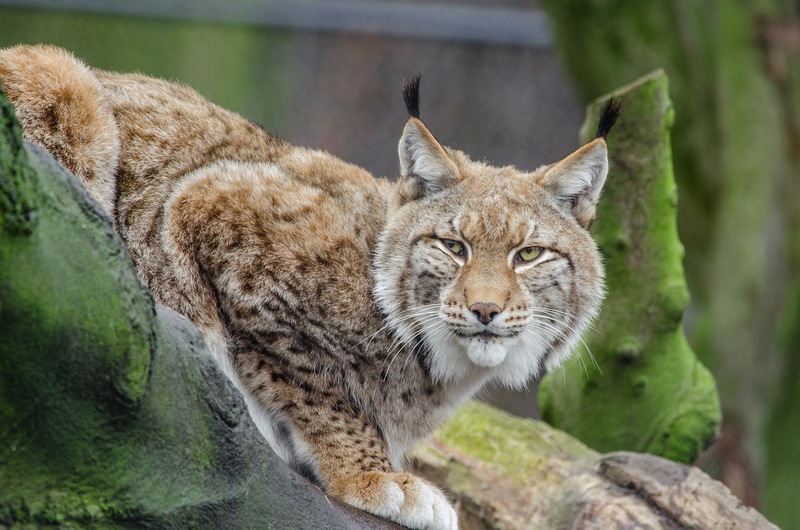 Re-introducing lynx to Scottish woodlands.... what a great idea! I saw lynx once; they were kittens, two of them lying in the sun on a rock by a Canadian river. The memory is still vivid after 50 years. Beautiful, elusive, shy, hunters they live deep in the woods (boreal forest ) surrounding the earth south of the tundra. They once lived in Scotland and there is a remote chance that they could be re-introduced. powerful enough to kill deer calves and we have too many of them anyway. The occasional lamb might well be killed if it strayed deep into the forest but the total will be far less than the 10 per cent of the annual crop lost near birth to starvation, exposure and disease each spring. Income from tourism exceeds that from sheep in the crofting counties and it's growing. Visitors come for the landscapes, the peace and quiet and the wildlife. I would just like to know that lynx were living out there I don't need to see one. But if you want a utilitarian argument and a justification in dollars or pounds sterling - introduce the lynx and more visitors would come. Just to know that there was large cat ( about the size of a slim Labrador) among the trees would enhance their experience and there would always be a chance, however slim, that they might see one, or a pair of kittens sunbathing. If you want to find out more just google, re-introduction of the lynx to Britain.